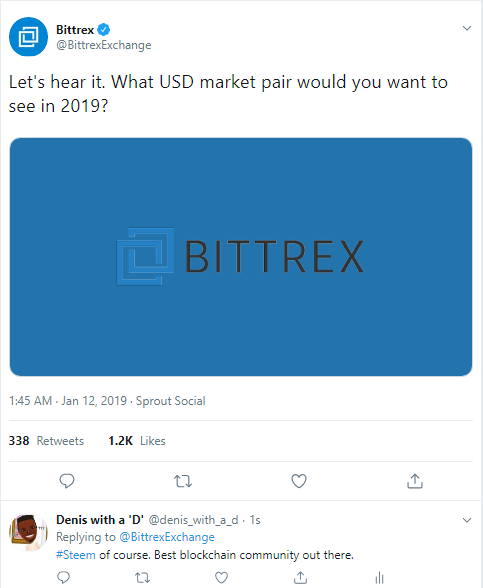 On twitter, the Bittrex account has thrown a net into the water fishing for suggestions about which USD crypto pair we would like to see in 2019. Since this is a very huge opportunity it would be fantastic if the Steem community came together and swam into this particular net. Why would a USD/STEEM pair be good for Steem? 1 - The most obvious one is that it simply cuts out the middle man blockchains that stand in the way of new users and current users interacting with Steem directly. This has always been a massive caveat that would be solved if you could easily purchase STEEM directly with fiat. 2 - If you are a trader this gives you the massive opportunity to convert your Steem into fiat and probably try to catch a lower price to help you grow your Steem holdings. USD is obviously a more stable currency and it will provide sanctuary when the markets are rough. 3 - Finally, you will get a chance to actually get value for your money whether depositing or whether withdrawing Steem. The amount of money you lose through fees while converting Steem into BTC or ETH or vice versa could easily be eliminated leaving the exchange fee alone. Those are some of the benefits I can come up with from the top of my head and I would imagine there are more. If you have a Twitter account why don't you play your part in seeing this become a reality. Till next time, keep Steemin'!